Similar to other animals, fish have evolved to have different types of teeth depending on their diets. For example, most fish that eat other fish (carnivores) have teeth that are designed to puncture, hold on to, and cut their prey whereas most fish that eat plants (herbivores) have teeth that are more suited for shredding things such as algae. This picture shows three common types of teeth that can be found in many of the different species of bony fish. The first type of tooth shown, the canine, is typical of most carnivores. The canine is a long tooth that is generally shaped like a cone and is either straight or curved. These teeth are used for piercing and holding the fish’s food, much like the canine teeth found in dogs or humans. The second type of tooth depicted, the molar, is generally found in bottom dwelling fish such as skates and chimaeras. They are flat, broad teeth used for crushing and grinding food like mollusks. The third diagram shows incisors. Incisors are used for cutting and they come in a variety of all different shapes that range from the same shape as human incisors, to the shape of a saw-edge or even fused into the “beak” of a Parrotfish like the fourth diagram in the picture shows. Where Do You Find Teeth In Fish? How Did Teeth Initially Develop? Based on living sharks (Squaliformes, such as dogfish), teeth are originally thought to have developed from scales covering the lips. 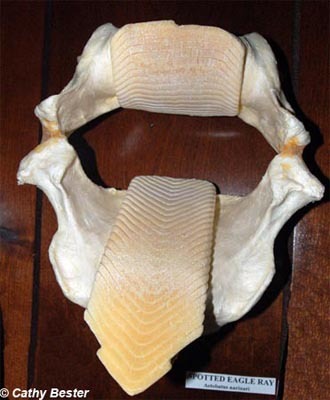 This is because the individual placoid scales on the sharks can be seen visibly grading into teeth on the jaws. The moray eel is interesting in that its pharyngeal teeth are modified. 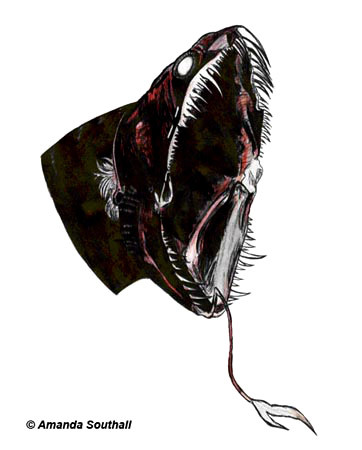 The eel is able to swing these teeth forward from its throat to grab on to its prey and move it down the eel’s throat (kind of like in the movie “Alien”). The jaw of a spotted eagle ray shown below has a perfect example of teeth used for crushing shellfish including clams, oysters, and whelks.